The longest and darkest night of the year marks "the night opening the initial forty-day period of the three-month winter",[rs 1] from which the name Chelleh, "fortieth", derives. [rs 2] There are all together three 40-day periods, one in summer, and two in winter. The two winter periods are known as the "great Chelleh" period (1 Day to 11 Bahman,[rs 2] 40 full days), followed/overlapped by the "small Chelleh" period (10 Bahman to 30 Bahman,[rs 2] 20 days + 20 nights = 40 nights and days). Shab-e Chelleh is the night opening the "big Chelleh" period, that is the night between the last day of autumn and the first day of winter. The other name of the festival, 'Yaldā', is ultimately a borrowing from Syriac-speaking Christians. [rs 1][rs 3][rs 4][rs 5] In the 1st–3rd centuries, significant numbers of Eastern Christians settled in Arsacid and Sassanid territories, where they had received protection from religious persecution. Through them, Iranians (i.e. Parthians, Persians etc.) came in contact with Christian religious observances, including, it seems, Nestorian Christian Yalda, which in Syriac (a Middle Aramaic dialect) literally means "birth" but in a religious context was also the Syriac Christian proper name for Christmas,[rs 6][rs 4][rs 1][rs 3] and which—because it fell nine months after Annunciation—was celebrated on eve of the winter solstice. The Christian festival's name passed to the non-Christian neighbors[rs 4][rs 1][rs 3][rs 5] and although it is not clear when and where the Syriac term was borrowed into Persian, gradually 'Shab-e Yalda' and 'Shab-e Chelleh' became synonymous and the two are used interchangeably. The word yalda, cognate with the Arabic Yelda meaning 'dark night' might be related to the Old Norse 'jól'/Old English 'geōl' (yole – yule). traditional sweet of yalda in khorasan zibad. 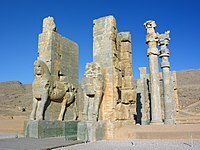 In Zoroastrian tradition the longest and darkest night of the year was a particularly inauspicious day, and the practices of what is now known as "Shab-e Chelleh/Yalda" were originally customs intended to protect people from evil (see dews) during that long night,[rs 7] at which time the evil forces of Ahriman were imagined to be at their peak. People were advised to stay awake most of the night, lest misfortune should befall them, and people would then gather in the safety of groups of friends and relatives, share the last remaining fruits from the summer, and find ways to pass the long night together in good company. [rs 7] The next day (i.e. the first day of Dae month) was then a day of celebration,[note 1] and (at least in the 10th century, as recorded by Al-Biruni), the festival of the first day of Dae month was known as Ḵorram-ruz (joyful day) or Navad-ruz (ninety days [left to Nowruz]). [rs 1] Although the religious significance of the long dark night have been lost, the old traditions of staying up late in the company of friends and family have been retained in Iranian culture to the present day. References to other older festivals held around the winter solstice are known from both Middle Persian texts as well as texts of the early Islamic period. [rs 1] In the 10th century, Al-Biruni mentions the mid-year festival (Maidyarem Gahanbar) that ran from 11-15 Dae. This festival is generally assumed to have been originally on the winter solstice,[rs 8][rs 9] and which gradually shifted through the introduction of incalcation.cf. [rs 9] Al-Biruni also records an Adar Jashan festival of fire celebrated on the intersection of Adar day (9th) of Adar month (9th), which is the last autumn month. [rs 1] This was probably the same as the fire festival called Shahrevaragan (Shahrivar day of Shahrivar month), which marked the beginning of winter in Tokarestan. [rs 1] In 1979, journalist Hashem Razi theorized that Mihragan — the day-name festival of Mithra that in pre-Islamic times was celebrated on the autumn equinox and is today still celebrated in the autumn — had in early Islamic times shifted to the winter solstice. [rs 10] Razi based his hypothesis on the fact that some of the poetry of the early Islamic era refers to Mihragan in connection with snow and cold. Razi's theory has a significant following on the Internet, but while Razi's documentation has been academically accepted, his adduction has not. [rs 4] Sufism's Chella, which is a 40-day period of retreat and fasting,[rs 11] is also unrelated to winter solstice festival. Food plays a central role in the present-day form of the celebrations. In most parts of Iran the extended family come together and enjoy a fine dinner. A wide variety of fruits and sweetmeats specifically prepared or kept for this night are served. Foods common to the celebration include watermelon, pomegranate, nuts, and dried fruit. These items and more are commonly placed on a korsi, which people sit around. In some areas it is custom that forty varieties of edibles should be served during the ceremony of the night of Chelleh. Activities common to the festival include staying up past midnight, conversation, drinking, reading poems out loud, telling stories and jokes, and for some dancing. Prior to invention and prevalence of electricity, decorating and lighting the house and yard with candles was also part of the tradition, but few have continued this tradition. Another tradition is giving dried fruits and nuts to family and friends, wrapped in tulle and tied with ribbon (similar to wedding and shower "party favors"). Prior to ban of alcohol, drinking wine was also part of the celebration. Despite the Islamic alcohol ban in Iran, many continue to include home-made alcoholic drinks in their celebrations. Tajikistan, which is also historically part of the region inhabited by Iranian peoples and therefore continues to have strong cultural and linguistic links to modern-day Iran, also celebrates Shabe Yalda beginning of 40-day chila (чила) forty days of cold weather. An association with the 40-day "chella" period is also preserved amongst Iranian Azerbaijanis and the people of the Azerbaijan Republic, who call the festival Çillə Gecəsi چیلله گئجه‌سی and which likewise refers to the beginning of the first 40 days of winter. In Tabriz, the most populous city in Iranian Azerbaijan, parents send some special foods such as kofte tabrizi, nuts, special gifts, sweets, and well-arranged fruit baskets to their daughter and her husband. Families make a special effort to gather in the homes of their grandparents to listen to the stories of their elders. Wikimedia Commons has media related to Yalda night. * ܝܠܕܐ (Syriac yaldā) in Wiktionary, the free dictionary. ^ The first day (Ormuzd day) of Dae month was/is the first of the four name-day feast days of the Creator Ahura Mazda (Dae, "Creator"; Ormuzd = Ahura Mazda),[rs 8] for which Al-Biruni notes that in earlier times, "on the day and month both called by the name of God, i.e. (Hormuzd), [...] the king used to descend from the throne of the empire in white dresses, [...] suspend all the pomp of royalty, and exclusively give himself up to considerations of the affairs of the realm and its inhabitants." Anyone could address the king, and the monarch would meet with commoners, eat and drink with them, and he would declare his brothership with them, and acknowledge his dependency on them (Albîrûnî, "Dai-Mâh", On the Festivals in the Months of the Persians in The Chronology of Ancient Nations, tr. Sachau, pp. 211–212). ^ a b c d e f g h i j Krasnowolska, Anna (2009), "Sada Festival", Encyclopaedia Iranica, New York: iranicaonline.com . ^ a b c d e f g h Omidsalar, Mahmoud (1990), "Čella I: In Persian Folklore", Encyclopaedia Iranica, vol. V, New York: Routledge & Kegan Paul, pp. 123–124 . ^ a b c Āryān, Qamar (1991), "Christianity VI: In Persian Literature. ", Encyclopedia Iranica, vol. V, f5, Costa Mesa: Mazda Publishers, pp. 539–542 . ^ a b c d Krasnowolska, Anna (1999), "Šab-e Čella", Folia Orientalia, 35: 55–74 . ^ a b Dehkhoda, Ali Akbar; et al., eds. (1995), "یلدا", Loghat Nāmeh Dehkhodā: The Encyclopaedic Dictionary of the Persian Language, Costa Mesa: Mazda Publishers . ^ Payne Smith, J., ed. (1903), "ܝܠܕܐ", Syriac Dictionary, Oxford: Clarendon, p. 192 . ^ a b Daniel, Elton L.; Mahdi, Ali Akbar (2006), Culture and customs of Iran, Westport: Greenwood, p. 188, ISBN 0-313-32053-5 . ^ a b Boyce, Mary (1999), "Festivals I", Encyclopedia Iranica, vol. IX, f5, Costa Mesa: Mazda, pp. 543–546 . ^ a b Boyce, Mary (1983), "Iranian Festivals", Cambridge History of Iran, vol. 3(2), Cambridge University Press, pp. 792–818 . ^ Razi, Hashem (1979), Gahshomari wa jashnha-e iran-e bastan, (Time-calculation and Festivals of ancient Iran), Tehran, pp. 565–631 , repr. 2001. ^ Algar, Hamid (1990), "Čella II: In Sufism", Encyclopaedia Iranica, vol. V, New York: Routledge & Kegan Paul, pp. 124–125 . ^ ČELLA, term referring to any forty-day period. ^ Richter, Joanne (2005). Iran, the culture. New York: Crabtree Pub. Co. p. 18. ISBN 0-7787-9317-6. ^ Bahrami, Askar, Jashnha-ye Iranian, Tehran, 1383, pp. 75-76.